You’ve likely heard and read that VoIP (Voice over Internet Protocol) calling can save your business money. But, do you really know how? Sure, the cost of calls through the internet is lower than through phone lines, but what else is there? This blog post lays out where all the savings come from — real, demonstrable savings. The upfront costs of a traditional plain old telephone service or PBX phone system can be exorbitant — and that’s just the first outlay. Consider the total cost of ownership — what you pay for upgrades, maintenance, adding new lines, and other changes. Then, consider the cost of VoIP calling, with a hosting provider. For a monthly user fee, the provider does the upgrades and maintains the hardware — and, if it’s a good one, it keeps working on the software and adding features to stay competitive. In addition, a VoIP provider makes it easy to add or subtract new lines — you just pay the monthly fee, get a new phone, plug it in, and you’re good to go. When you purchase the hardware your business needs for its phone system — the servers, racks, cabling, telephones, etc. — that’s considered a capital expense, or CAPEX. Since the equipment is expected to last several years, there are tax implications. You’ll need to lay out all the money up front, often many thousands of dollars, but can only depreciate portions of it each year on your taxes. On the other hand, the cost of VoIP calling is considered an operating expense, or OPEX. This means that you can expense the costs in the year you incur them. So, not only do you not need to come up with tons of money for your phone system, you get to expense what little you do spend and thus reduce your taxes. Let’s outline the advantages and savings that can be seen clearly when comparing VoIP calling to the traditional phone system. In addition, if you have offices in multiple locations, a traditional phone system brings extra costs and complexity, often because of duplication of services. VoIP calling mitigates “that duplication, that extra waste, [and] you really start to see some economic benefit and efficiencies within telecommunications,” according to Alex Desberg, sales and marketing director at Ohio.net. When a business switches to VoIP calling, it typically cuts calling costs between 40% and 90%. But the savings and advantages don’t stop there. It’s easy to see what VoIP calling costs by looking at the bill from your provider. But there are additional savings and advantages, often not thought about, that can make your business life easier. Today’s agile businesses are on the go and often include workers in remote locations or other offices. Often they prefer to use their own mobile devices, and have demonstrated boosts in “employee satisfaction, mobility, and productivity” when doing so. If you use VoIP, the software can easily be installed on smartphones, laptops and tablets, so the device becomes an extension of the office phone system. This eliminates the need to limit communication to the confines of the office, opening up chances to extend hours and using a mobile device to make costly calls. Consider a senior exec who often travels between the Los Angeles office and China. If the office uses a traditional phone system, she can’t easily access it while traveling. Instead, she relies on her mobile phone and racks up sky-high monthly bills. If the company used VoIP calling instead, those mobile calls back to the office would be free. Companies with traditional phone lines often have a telecom vendor, a video conference vendor, and instant messaging vendor, and the list goes on. It can be difficult to track all the bills, deal with ever-changing account managers, and even know exactly what your communication systems are costing you every month. With VoIP calling, you can have one hosting provider. It provides all the features you use — messaging, phones, BYOD, and conferencing. And, it does so with a single monthly bill. This means you know exactly what you’re spending and need deal with only a single supplier. In addition, if your travel budget is getting out of control, VoIP video conferencing makes it easy to stay in touch at a mere fraction of the cost. 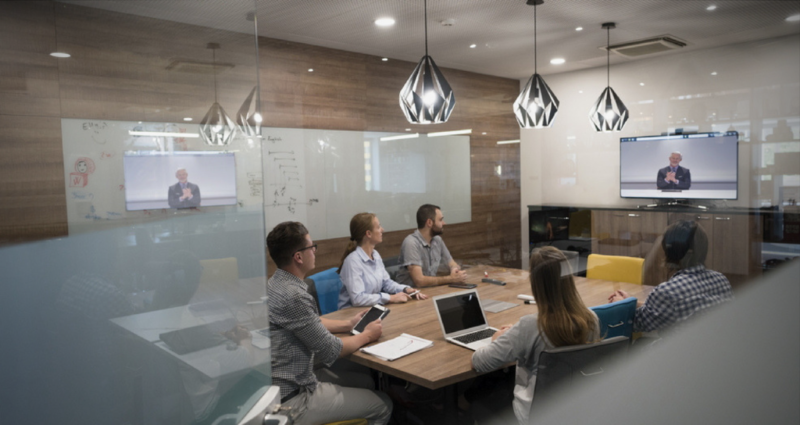 With VoIP video conferencing it’s easy, and cost-effective, to stay connected over long distances. With VoIP calling, you can pre-configure individual extensions to failover to a cell phone in an emergency. This means business stays up and running. If a traditional phone system fails, no calls can get in or out, leading to perhaps extended downtime, minimized productivity, and lost revenue. With hosted VoIP, you don’t need somebody who is technically inclined to be able to maintain and update the system because it is part of the provider’s service. In some cases your VoIP provider will also manage your users, set up call flows and customized messages, and provide other customized services as part of your monthly subscription fee. The entire focus of a business-grade VoIP system is to accommodate the various ways we all communicate and collaborate. Employees have emails, faxes, office voicemail, and their personal mobile devices to keep up with everything. Full-featured VoIP can be the “holy grail” and unify all these ways to communicate through a central dashboard. Most companies today, with a blend of executive, administrative, and sales staff, want to enhance how employees work together. Unified Communications, provided with VoIP calling, can offer measurable dollar-based improvements in productivity. That’s exactly the kind of system Voxter provides. When you’re ready to cut costs, boost production, and enhance communication efficiency with VoIP, give us a call at 866-381-8647 or contact Voxter today.